Religulous, one of the most critically-acclaimed films of the year as well as the highest grossing documentary of the year arrives on DVD from Lionsgate. This fascinating film follows comedian and TV host Bill Maher (HBO’s “Real Time with Bill Maher,” TV’s “Politically Incorrect”) as he travels around the world interviewing people about God and religion. Known for his astute analytical skills and irreverent wit, Maher brings his characteristic honesty to an unusual spiritual journey. 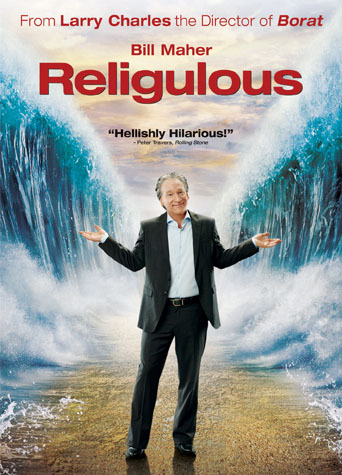 Produced by Jonah Smith, Palmer West and Bill Maher, and directed by Larry Charles (Borat, HBO’s “Curb Your Enthusiasm”), Religulous has been worshiped by critics across the nation garnering such praise as “one of the funniest and most offensive documentaries ever made” (New York Post), “highly provocative” (Larry King), “brilliant” (Variety), “hellishly hilarious” (Rolling Stone), “laugh-out-loud outrageous” (Associated Press) and “fearless as a fatwa and as subtle as a second coming…a revelation” (Orlando Sentinel). The DVD special features include audio commentary with Bill Maher and Larry Charles, deleted scenes plus new monologues with Bill Maher filmed at eight different locations visited while making the film. Religulous will be available on February 17, 2009. In Religulous, Bill Maher takes a pilgrimage across the globe on a mind-opening journey into the ultimate taboo: questioning religion. Meeting the high and low from different religions, Maher simply asks questions, like “Why is faith good?” “Why doesn’t an all-powerful God speak to us directly?” and “How can otherwise rational people believe in a talking snake?” For anyone who’s even a little spiritually curious, this divine entertainment will deepen your faith...in comedy!